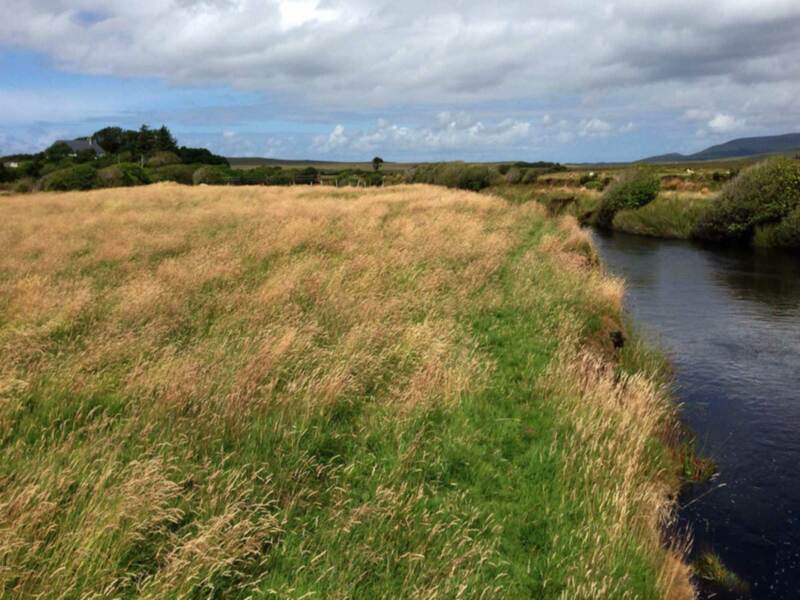 Shean Lodge Fishery is set in the beautiful, yet untamed Ballycroy National Park. Although the primary reason for visitors come to Shean is to fish, they can also enjoy other activities such as hill walking on some of the excellent Mayo Walking Trails, the natural wild life and attractions such as the Ceide Fields, Westport House, or you might like to try your hand at deep-sea angling, world famous, nearby, and easily arranged. Ballycroy National Park is situated on the entire East side of the Shean stretch of the Owenduff River, which thus forms one boundary with the National Park. The Park comprises 11,000 hectares and is uninhabited. It is made up entirely of Atlantic bog and mountain terrain; this is important because it is one of the last intact bogs in Ireland, indeed in Western Europe. So, the Lodge is very fortunate to have such a neighbour, responsible for its 4000 hectares of shooting rights. Please follow the link to The National Park web site which contains a wealth of information on the park and its environment. Of particular note is the uniqueness of the blanket bog; this depends on a rainfall of more than 2000mm per annum which allows the prolific growth of the sphagnum mosses, black bog rush, moor grass and bell heather which are some of the main ingredients of blanket bog. In turn, this creates a perfect environment for the wildlife present, such as Greenland White-Fronted Geese, Golden Plover, Red Grouse and Otters to mention just a few. The prominent mammals are the Irish hare and recently returned Red Deer. The National Park Interpretative Centre in Ballycroy is well worth a visit. Included in it are some photographic images taken over the years by guests and some prize fish caught at Shean and a detailed explanation of exhibits on the fauna and flora. As a guest in Shean the wild life that encompasses you is conspicuous, especially the birds. Fishing with a pair of binoculars hung around one's neck can be recompensed by the extra birds discovered and otherwise missed. An exhaustive list is available here as well as details of all local fauna and flora. It is exciting to be in residence at the Lodge in winter when the migratory birds are present such as Fieldfares, many species of Duck and Whooper Swans. They can be viewed from around the house, also in Keel in Achill and on Mulranny Strand. Stonechats, Barnacle Geese plus wading and sea birds abound. BirdWatch Ireland has details and photographs of native birds and migrants and local branches that organise events, please visit their web site for news, events and information. If you are a Hill-Walker Shean is an ideal venue for all grades of walkers: from pleasant strolls around the trout lakes and along the river to a good workout on the mountain peaks. Here are a few ideas: on the doorstep is Bunmore, a two-hour walk in waist-high heather. Corryloughaphuill or Volcano Walk starts from the Bellagaravaun road. Follow the stream to the top of the hill to the lake, a sluice gate was built here to provide a flood on demand for anglers. It must have cost a fortune to construct; it's a great shame it didn’t work! Scardaun is another eight hour circular walk, and a hard one, of constantly changing landscape. Shean is situated near to the Bangor Trail. It is a marvellous walk. What makes it so different is that virtually no habitation is encountered on the route. Leave plenty of time to complete the 22 kms, bring a mobile phone, a map of the route and make sure someone knows you are walking it. Walking on Mweelrea, the highest mountain in Mayo is achievable, but only in the summer. Don’t walk Nephin Mor, it’s not a pleasant experience, as it is entirely broken mountain, and one is in danger of falling. The latest walking attraction is the Great Western Greenway together with its many loops, which can also be travelled on a hired cycle and is highly recommended. It is estimated that more than 200,000 people use it in a year. There are many Islands to be visited. Achill Island is the largest on the coast with a population of 3,000. It has beautiful beaches, some of which specialise in wind surfing, sailing and canoeing, other islands that recommended are Inis Bigil and Clare Island. One of the finest 9 hole golf courses in the West of Ireland. Mulranny Golf Links is a wonderful nine-hole course set on the shores of Clew Bay in Mulranny Co Mayo. On a fine day it boasts fantastic views of Croagh Patrick and Clare Island as you look across Clew Bay. Each of the nine holes has unique features which pose different challenges to all categories of golfer. Mulranny also has the advantage of being close to Shean Lodge! Carne in North Mayo on the West Coast of Ireland lies in magnificent unspoiled sand dunes overlooking Blacksod Bay and the wild Atlantic Ocean near the town of Belmullet. Erris in North Mayo is an area famed the world over for its golf course and white sandy Atlantic beaches that stretch for miles, its bountiful wildlife and warm welcome. Carne Golf Links was the last links course to be designed by the late Eddie Hackett and it is now believed by many who have played it to be his greatest challenge.